Eight times in American history, vice-presidents have ascended to the presidency as a result of death in office by the president. While modern voters may evaluate vice-presidential candidates on their fitness to be a mere heartbeat away from the White House, it took eight “accidental” successions, including four assassinations, before this nation provided for that as a matter of constitutional law, with the passage of the Twenty-Fifth Amendment. 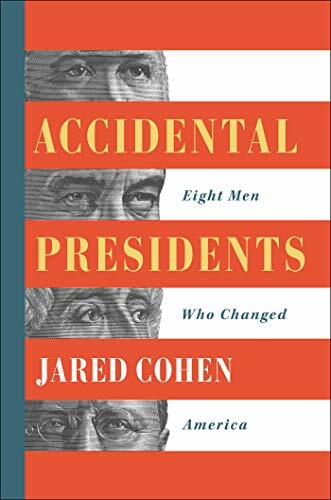 In Accidental Presidents: Eight Men Who Changed America, Jared Cohen examines the presidencies of those who found themselves in the nation’s highest office by the accident of death. According to Cohen, in the early days of our country, and up into the mid-20th century, presidential candidates didn’t select their running mates but generally had them foisted upon them by their party based solely upon the vice-presidential candidate’s ability to draw votes from areas of the country in which the presidential candidate lacked that ability. Of the eight accidentals, the author concludes that only two were successful: Theodore Roosevelt, William McKinley’s successor, and Harry Truman, who succeeded Franklin Roosevelt. Ironically, Theodore Roosevelt ended up as McKinley’s vice president against his own wishes, but simply because Republican party bosses wanted him out of New York, where he interfered with their personal ambitions. The vice presidency seemed the ideal place to sentence him to irrelevancy, and Roosevelt was nominated on the first ballot in 1900, in a near-unanimous vote. The sole dissenting vote was cast by Roosevelt, himself. Less than a year later, an assassin’s bullet felled McKinley, and the reluctant Roosevelt found himself in the White House. Subsequent history shows that he took quite a liking to it. But FDR was likely already dying when his last term commenced, and in a matter of weeks, Truman “inherited a greater burden and with less preparation than any accidental president.” Yet he rose to the occasion, ending World War II with probably the most significant presidential decision in history to that date, authorizing use of the atomic bomb on Japan, then he shepherded the country through the Korean War and the beginnings of the Cold War. Other impactful accidentals, though somewhat negatively, were the two Johnsons: Andrew Johnson, Lincoln’s successor following the Civil War, and Lyndon Johnson, John Kennedy’s successor in the turbulent civil rights and Vietnam eras of the 1960s. As for the earlier Johnson, the author notes that history has been “justifiably critical of him for squandering the postwar Reconstruction and peace,” and that the “consequences for civil rights were devastating.” He was the first American president to be impeached, surviving removal from office by a margin of one vote in the Senate, and was defeated in his first, and only, try for the presidency on his own merits. While much is known about the two successful accidentals, Roosevelt and Truman, and the partially-successful Lyndon, the latter Johnson, much of the book’s treasure lies in earlier, lesser known accidentals. The trailblazer on this path was John Tyler, who is most remembered as the president who teed up the annexation of Texas to the Union by a joint resolution of Congress. His successor, James Polk, presided over the actual annexation. Conventional wisdom has it that William Henry Harrison, whom Tyler succeeded, died of pneumonia 30 days after delivering a one hour forty-five minute inaugural address in a frigid rain. Later historians believe that Harrison, as well as James Polk, Tyler’s successor, actually died from enteric fever, caused by “a field of human excrement that, in the absence of a proper sewage system, flowed into a marsh near the White House.” Surely an apt metaphor can be found there for D.C. politics. The accidental Tyler thus succeeded this nation’s shortest-lived presidency, excluding that of Daniel Rice Atchison, who may have technically served for one day. When Polk’s term ended at noon on a Sunday, Zachary Taylor refused to take the oath of office on the Sabbath, instead holding off until the following day. That temporary absence of a sworn president and vice-president elevated Atchison, the president pro tempore of the Senate, to the presidency as a one-day placeholder. Theodore Roosevelt was the next accidental and, as previously noted, successful presidency, but then a few presidencies later, Calvin Coolidge spent most of his accidental years cleaning up the scandals that his predecessor, Warren Harding, left upon his death. Coolidge sufficiently escaped the taint to be elected in his own right in 1924, only to retire following that term and turn the White House over to Herbert Hoover just in time for the beginning of the Great Depression. In politics, as in life, timing is everything. The author notes there have also been several close calls, such as failed assassination attempts on Harry Truman, Gerald Ford, and Ronald Reagan, and illnesses of James Madison, James Polk, Woodrow Wilson, and even Dwight Eisenhower who suffered three medical emergencies while in office, including a heart attack. Because the thesis of the book is about ascension to office due to a president’s death, it does not include Gerald Ford, who may well have been accidental-squared, first reaching the vice presidency only because of Spiro Agnew’s resignation under a cloud of scandal, then stepping into the Oval Office because of Richard Nixon’s resignation under his own cloud of scandal. But that, one supposes, is a topic for another book.